A British nuclear submarine has been caught on camera after it apparently became stricken with technical problems while on a top-secret mission in one of the most dangerous parts of the world. Satellite images show the Royal Navy vessel undergoing repairs at a port less than 100 nautical miles from Iran. 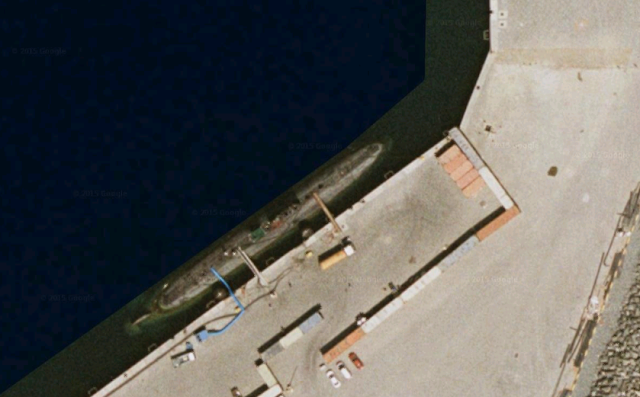 The nuclear-powered submarine is pictured docked at Fujairah, one of the United Arab Emirates, in the politically sensitive seaway of the Gulf of Oman. Wow. Check out the physical security, or lack thereof. Almost a straight shot from the highway to the west.